Melt the chocolate in a heatproof bowl suspended over a saucepan of barely simmering water. When melted, stir in the butter and condensed milk. Set a quarter of the ginger aside and stir in the remainder with the crushed biscuits and the coconut. Mix well. Spoon the mixture into a baking tray lined with greaseproof paper. Level the surface and dot with the remaining ginger pieces, pressing them into the chocolate. Chill overnight before lifting out with the paper and cutting into small squares. 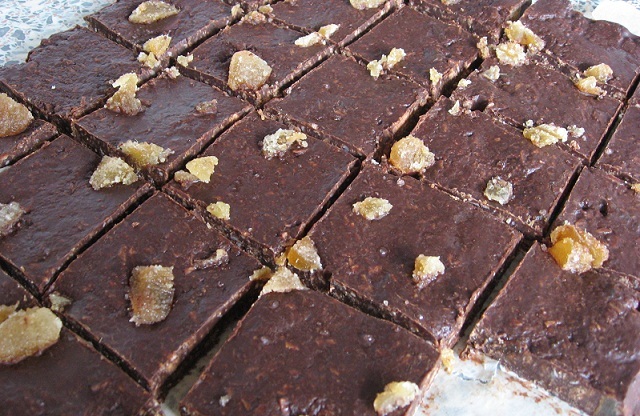 I love the ginger/chocolate combo and it tastes particularly good with a cup of espresso! I made these with digestive biscuits rather than ginger biscuits as I was going gluten-free, so presumably that toned down the gigner a little. I loved your blog on this, but have to say I’ve never suffered ‘gastric irritation’ from ginger!